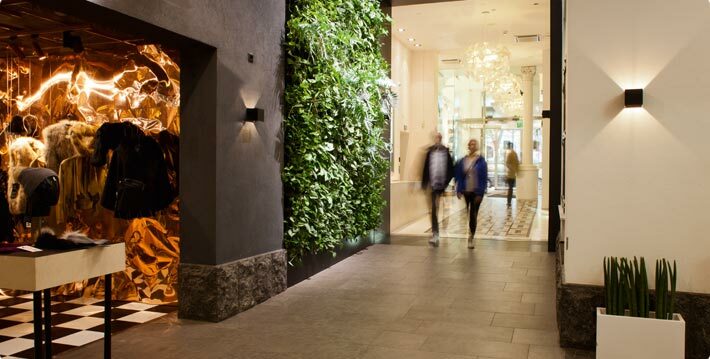 Kämp Galleria is the Fashion District of Helsinki – a must for any style-conscious shopper. The shopping centre hosts nearly 40 top fashion and design shops and high-quality restaurant and beauty services on three floors. The elegant architecture, the historical milieu, and the nearby luxury hotels Kämp and GLO create their own, unique addition to the international atmosphere of the Fashion District. We welcome you to enjoy fashion, beauty, and taste sensations in Kämp Galleria where both the products and the service are unparalleled. Mon-Fri 10 a.m. to 8 p.m.
Entrances to Kämp Galleria: Aleksanterinkatu, Mikonkatu, Pohjoisesplanadi, Kluuvikatu. The shopping centre’s maintenance yard is located at the address Kluuvikatu 2-4. Goods deliveries are permitted via Kluuvikatu between 6 am and 10.30 am on weekdays. security guard on +358 50 461 6961. You can access Kämp Galleria from the Helsingin Yliopisto metro station in a couple of minutes. Go to the end of Opintoputki and take Kluuvikatu to the entrance in Aleksanterinkatu. Mikonkatu will take you from Rautatientori (Railway Square) directly to the shopping centre. Tramlines 2, 4, 4T, 7A, and 7B run on Aleksanterinkatu. Europark P-Kluuvi is an underground parking area next to Kämp Galleria and fits 700 cars. Entrance and exit on Kaisaniemenkatu and on the corner of Fabianinkatu and Pohjoisesplanadi.